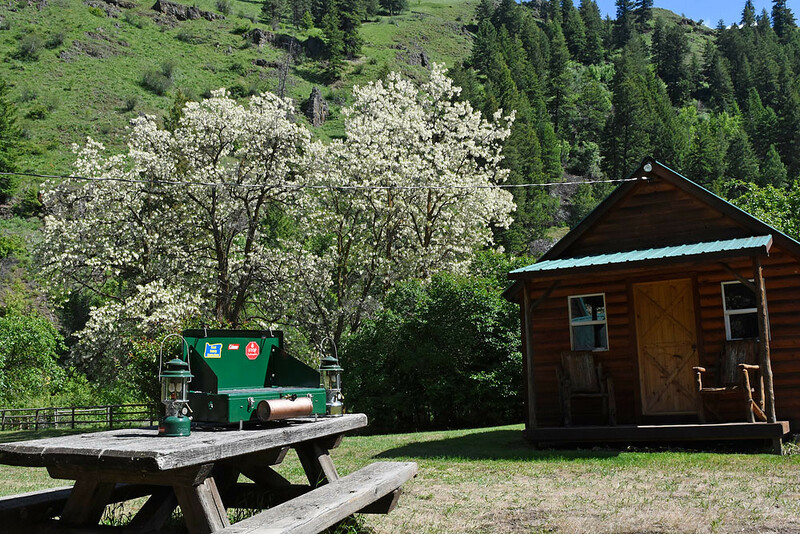 Old Coleman Parts Online Store > Categories > Gatherings, Meets & Get-Togethers > Any interest in an NE Oregon remote cabin get-together? 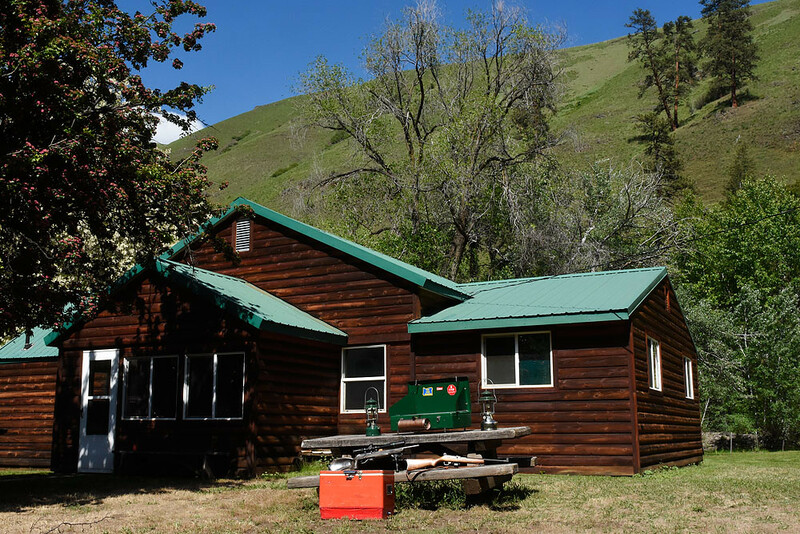 A good friend of mine owns a remote hunting cabin in the wilds of the Hell's Canyon country. 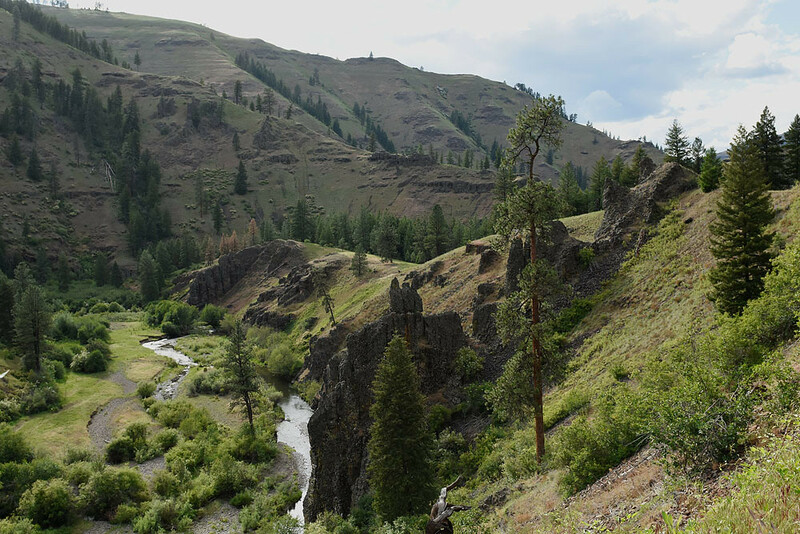 It's behind a locked gate about 35 miles north of Enterprise, OR, on dirt and gravel roads--the last eight pretty rough--and completely surrounded by the Wallowa-Whitman NF. Good bird hunting--grouse, chukar and maybe turkey--and excellent small stream fishing--on a private stream--for native rainbow. There are inside sleeping accommodations for about eight people, and plenty of room for campers or tents. One bathroom, plumbed even, with shower. Full kitchen, like that matters. Dogs are welcome, but there are rattlesnakes about, and this is a hell of a place to lose a dog or a cow. It runs $400/night to rent, which we can split up. Late May/early June--when the pics above were taken--is the best time. If we get a bunch of folks, we can get a porta-potty hauled down for a few more $$. My buddy will have to sell the place soon due to health problems, so it's probably this year or never. If anyone's interested, post here. We'd need enough to make the cost low--say six to eight folks.
. +1. That looks like a beautiful place to call home for the weekend. Wish I could say yes but it's a little far for me,and I already have a Pop-up rally early June.. If I was closer I'd do it in a heartbeat. That place looks beautiful I've wanted to see it in person the first time you posted pics from there. It's a shame your friends health is going to force him to sell it.the place sounds like heaven. Did I mention no cell reception?
. That would be the best part right there. No phone ringing for the whole weekend. I'll at least get a couple more opportunities to camp there this spring. I'm hoping my back is recovered enough to allow me to hike to the remote cabin downstream, where the owner believes there is a stash of lanterns and a stove or two. Eight miles each way of very rough canyon trail should be interesting. Same here. That would be a fantastic trip. Know any one with a packhorse? That way, even if you don’t ride, the horse can pack in your gear which will make for an easier hike and then the horse can pack out the loot! Dang Timm. That looks dreamy. A bit far for me coming from Nor Cal. But keep asking. If I happened to be in Idaho and had the time I would blaze over in a heartbeat. Ever try riding a horse on mountain and canyon trails with sciatica? I'm just thinking I might be able to walk. BTW, the cabin in the photos is road-accessible. There's another cabin downstream eight miles, where there may or may not be a stash of GPAs. I know a shortcut to the cabin, as I worked a few years in this canyon, but it's still a good fifteen mile day there and back. I used to consider that and average day of work. So, essentially you are going to have to hike 15 miles total, taking the mile shortcut, to a cabin the may have gpa items, gather them up and walk out. I say you take an external frame pack to hang lanterns from and hopefully stuff the stove into for the trek out. I can just picture you walking out of the canyon, couple of lanterns swinging high and a big smile on your face! Hope you get to check it out, Timm. Won't be in the area until after July 4. Does that come with maid service and a cook? Mark: Nobody said it was going to be easy! I've already picked most all of the low-hanging fruit in the county, so it's gettin' to be time for extreme measures. Duane: Unfortunately, that'll likely be going on towards extreme fire danger and smoky skies. But get in touch of you're in the neighborhood! I think it's only around $3M. Pocket change!